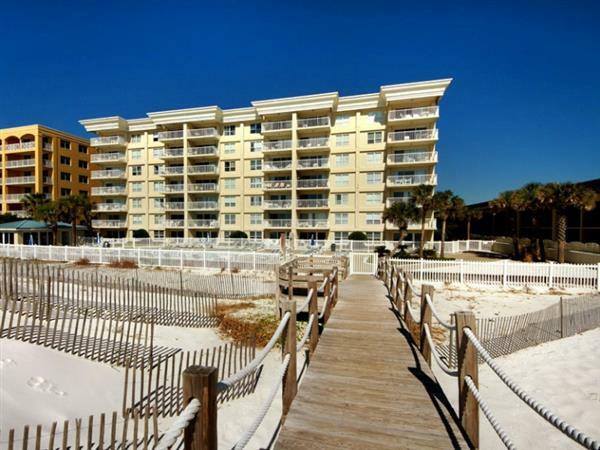 If you are looking to break away from the rat race and chaos of Destin, take a look at Sea Oats conveniently located on Okaloosa Island for your next getaway family vacation. Families love the relaxation and activities on the beautiful Emerald Coast beach. This stunning beachside property is walking distance away from the Okaloosa Pier, many restaurants, and busy local shops. The Emerald Coast convention center is located less than a mile away so if your trip is taking you to the convention center, you aren’t that far away from here! Take a relaxing outdoor shower then take a walk down the private beach boardwalk which will take you on a stroll to the hot tub for a relaxing soak and beachfront pool for a quick dip. Personal services are available on the beach and around the area for anyone staying at Sea Oats, for a small fee, or you can bring out your own amenities at your leisure to enjoy while you are out on the beach or lounging at the pool. There are so many things to do and to see around Sea Oats. Fort Walton Beach restaurants and attractions like the famous fishing pier, the Gulfarium, Fudpucker’s and the shops and restaurants on the boardwalk are a short distance away. There are quite a few on-site amenities at Sea Oats to keep you busy and relaxed. The tennis court and small workout room are perfect for anyone wanting to continue their health and fitness routine even while relaxing and on vacation. Take a break, unwind and receive a water massaging bath in the separate outdoor jacuzzi room. It is the perfect ending to any workout and can rejuvenate and relax anyone for an exciting evening ahead. Take a dip in the beautiful pool or sunbathe in one of the large numbers of lounge chairs surrounding the pool. There is never a shortage of chairs around the pool at Sea Oats! Enjoy a quiet evening in the barbeque grill area for an exciting dinner then take a stroll down the boardwalk that leads directly to the beach for an evening walk in the sand with waves crashing in around your feet. Sea Oats is filled with many on-site amenities to make your vacation truly unforgettable. If a perfect family vacation is what you are looking for, Sea Oats is the place you want to be for the ultimate and unforgettable family beach vacation.